CIA AUTOPLEX OFFERS A UNIQUE BUYING EXPERIENCE AND EXCEPTIONAL PRODUCT AND SERVICES. WITH A NO PRESSURE SALES ENVIRONMENT AND A PRICING STRATEGY CENTERED AROUND FAIR MARKET VALUES THAT IS PROVEN TO SELL CARS. OUR COMPETITIVE AND CUSTOM FINANCE OPTIONS WILL MAKE YOUR FINANCIAL DECISION QUICK AND EASY! ALL SALES ASSOCIATES ARE EQUIPPED TO PROVIDE TOP NOTCH SERVICE FROM START TO FINISH. VEHICLES IN INVENTORY ARE FULLY INSPECTED AND SERVICED BY PROFESSIONAL TECHNICIANS ON STAFF THAT ARE ASC CERTIFIED TO ENSURE THAT WE GET THE BEST POSSIBLE QUALITY VEHICLES TO OUR CUSTOMERS! OUR COMPANY NOT ONLY SPECIALIZES IN PREMIUM PRE OWNED VEHICLES BUT ALSO OFFERS EXTENDED SERVICES, PRODUCTS AND ACCESSORIES. WE ARE AN OFFICIAL CARFAX ADVANTAGE DEALER WITH AN A RATING WITH THE BBB. FOR MORE INFO CALL(601) 825-9051 OR VISIT US ONLINE @CIAAUTOPLEX.COM FOR VEHICLES IN INVENTORY, VEHICLE DATA, PICS, FREE CARFAX REPORT AND APPLY FOR FINANCING OPTIONS!!! PICK UP AND DELIVERY FOR QUALIFIED BUYERS!! 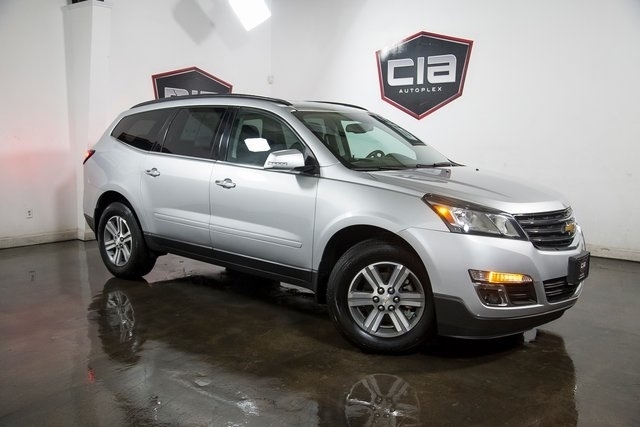 Visit CIA Autoplex online at www.ciaautoplex.com to see more pictures of this vehicle or call us at 601-825-9051 today to schedule your test drive. Message: Thought you might be interested in this 2015 Chevrolet Traverse.